Late Monday evening, we told you about three new 10 inch Android 4.2 flavored tablets coming from Toshiba. Of the three, the entry-level model was named the Toshiba Excite Pure. Unlike the other two Android slabs that were announced, the Toshiba Excite Pro and the Toshiba Excite Write, the Toshiba Excite Pure sports a NVIDIA Tegra 3 processor under the hood. The other two tablets are powered with the Tegra 4. The tablet is 10.2mm thick and weighs 600g. By the way, that rugged looking silver back cover is made from plastic. The 10 inch glass on the Toshiba Excite Pure offers resolution of 1280 x 800 and while you already know about the Tegra 3 processor under the hood, we should tell you that the slab will feature 1GB of RAM and 16GB of native storage. The latter can be expanded thanks to the microSD slot on the device. There is also an HDMI port and the cameras on back and front come in at 3MP and 1.2MP respectively. For those who need the feel of a physical QWERTY, Toshiba is going to offer a Bluetooth Keyboard Cover. Not only does it provide a better typing experience, it also doubles as a stand, allowing you to prop up your tablet and use it in a similar fashion to the way you would a laptop computer. While we don't have any pricing on the Keyboard Cover, the tablet itself is tagged at £249 ($381 USD) as an exclusive for Currys and PC World in the U.K. I honestly don't know why some companies even bother entering the low-price tablet market. There is little profit to be had already; plus the competition is rough with the kindle and nexus. 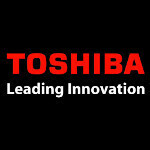 But good luck anyway, Toshiba.